We are completing what became more than a week-long peace delegation to Venezuela organized by the US Peace Council and the Committee for International Solidarity in Venezuela (COSI). The trip was complicated by American Airlines cancelling all flights in and out of the country, leaving us scrambling for ways to get there and get home. We also arrived in the midst of the attack on Venezuela’s electrical system, which caused further complications. Our delegation met with community groups, political parties and members of the government, including a private meeting with President Maduro. One theme that became obvious during the visit is that the United States’ imperialism is fundamentally weak. It relies on lies and bullying threats to get its way. So far, Venezuelans are resisting everything the US and its allies are throwing at it, but they remain vigilant and concerned about an escalation of attacks. Rallying with the women oil workers outside the presidential palace on March 15, 2019 in Caracas. The attack on Venezuela’s electrical grid began on March 7 and continued for several days. The outage made life difficult for Venezuelans. Without electricity, water pumps could not bring water to people’s homes, refrigerators weren’t working and the subway couldn’t run. People lined up to fill buckets with water. Lights were on, but not everywhere. When we talked to residents, we learned how they came to their neighbor’s aid, sharing food and water. Despite years of economic difficulties caused by US and allied countries’ sanctions, there were no reports of looting or unrest in Caracas. Venezuelans remained calm and steady while confronting the challenges of the blackout. School and work were cancelled until March 14, but some people were out anyway and a few shops were open. Maduro explained that the attack on the electrical grid came from the United States. There is evidence it emanated from Houston, the home of the company that provided infrastructure for the grid, and Chicago. There were also attacks on power lines and substations inside Venezuela. When a section was repaired, it would be attacked again. Maduro told us the plan had been for the attack on the electrical grid to cause chaos and confusion in order to provide an excuse for US intervention. The plan failed. Venezuelans realized this was part of the US-led coup campaign, and rather than becoming divided, they united. Russia confirmed the Venezuela account and said it was supported by other evidence. The Grayzone reported on a 2010 memo about regime change in Venezuela, which included discussion of an attack on the electrical grid to cause a blackout and chaos. The US tried to sabotage the Iranian electrical grid and has used electricity attacks in previous coups, so this is part of the US coup playbook. During our stay, CNN also reported that the drone assassination attempt against President Maduro last August was organized in Colombia and that the US was in close contact with the assassination plotters. It was also confirmed by the NY Times that it was the opposition who burned USAID trucks on February 23 at the border, the day of the humanitarian aid defeat. This corroborates the report by the Grayzone Project the day it occurred. The democratically-elected government of President Maduro worked to end the electricity crisis, provide people with water and food and make sure buses were running. The self-appointed coup’s Juan Gaido worked with the United States, which caused the blackout and their hardships. Gauido is being investigated for his involvement in the electrical attack. He is allied with countries waging an economic war that is causing financial distress, and he is calling for foreign military intervention, a traitorous action. 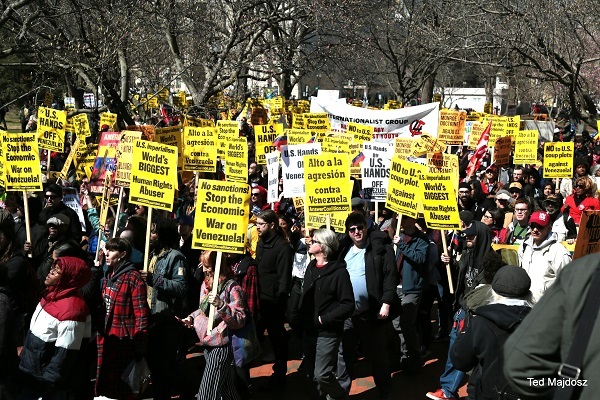 The attack mobilized more people in the US and around the world to opposethe US coup calling for ‘Hands Off Venezuela,’ an end to the sanctions and an end to threats of war. Another mass march in support of Venezuela is scheduled in Washington, DC on March 30. We attended an ongoing rally outside the presidential palace to defend it. On Saturday, there was a mass protest of tens of thousands of people celebrating the country coming together to confront the attack on their electrical grid. 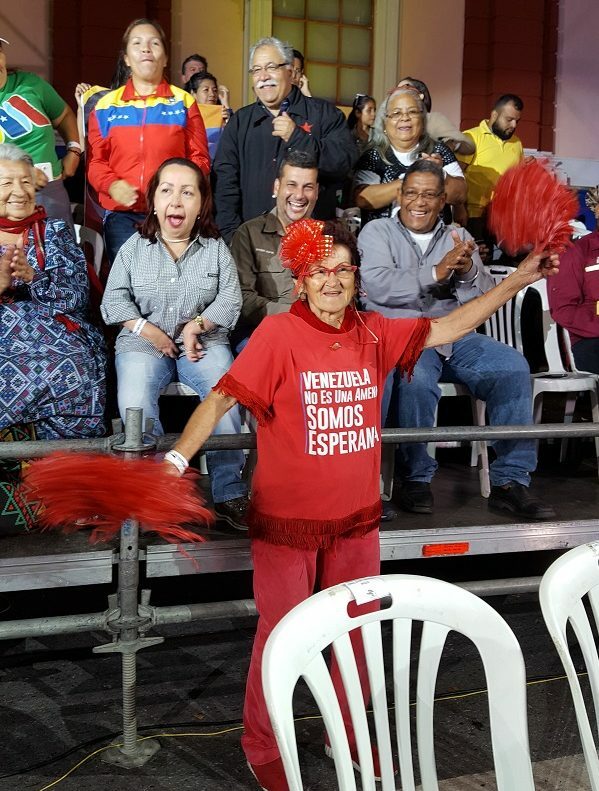 People were dancing, singing and chanting their support for President Maduro. While there were several opposition protests announced, when a member of our delegation went to cover them, they were not to be found. 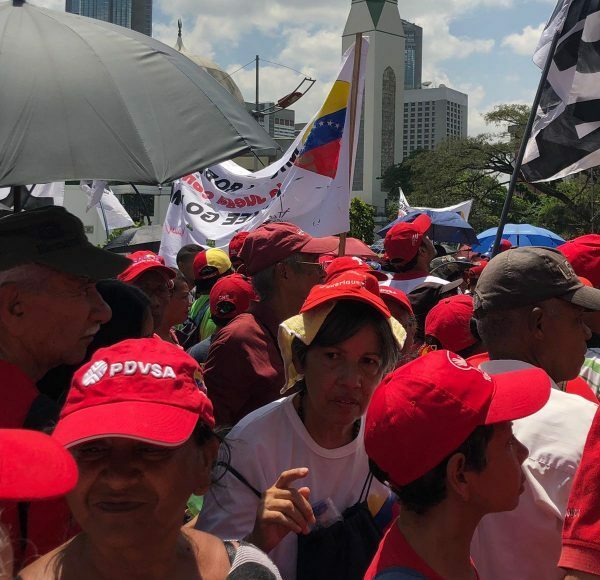 Pro-Bolivarian Process rally on Saturday, March 16, 2019 in Caracas. On Tuesday, the US Embassy in Venezuela was forced to close because it was being used as a center for organizing the ongoing US intervention. President Maduro told us how the US openly tried to bribe and threaten officials in his government and in the military and how they threatened his wife and family. The US told the opposition to boycott the last election and told candidates not to run against him. They knew they would lose an election to Maduro, so the plan had always been to falsely claim the election was illegitimate. Maduro wants to have a dialogue with the US but the embassy had to close because not only was it undermining his government but it provided justification for the US to intervene on behalf of its diplomatic staff. Venezuela plans to have dialogue with the US through its UN representative. When the embassy personnel left, we received word we were “on our own.” The State Department issued a statement describing civil unrest in Caracas saying that Americans could be arrested at any time for no reason. They warned people it was too dangerous to come to Venezuela. This was echoed by the Airline Pilots Association, who told their pilots not to fly to Venezuela because of the dangers. The morning of these declarations, we went for a walk in Caracas to look for unrest. Families were out with their children, people were shopping and eating pizza, and ice cream. Caracas is as active and safe as any big city in the United States. Members of our delegation described in this video the calm in Caracas and how the US was falsely claiming civil unrest to manufacture an excuse for US intervention. The people of Venezuela are prepared for more struggle, building a self-sufficient resistance economy and the will fight to preserve their independence. When we talked to Venezuelans, one thing they commonly told us was ‘thank you for coming to Venezuela, now you can tell people in the United States the truth about our country when your politicians and media lie about us.’ The Venezuelan people want a good relationship with the people of the United States. President Maduro told us of his love for the United States and how he had driven through Chinatown, Little Italy, and Harlem in New York, visited many cities in the US, was offered a contract to play for the Los Angeles Dodgers, and loves basketball and Jimi Hendrix. Maduro has offered to meet with President Trump to discuss and resolve their differences. His Foreign Secretary met with John Bolton — a fruitless meeting, but an attempt by Venezuela for dialogue. Venezuela wants a positive relationship with the United States but it will not give up its sovereignty, independence, or pride, and is prepared to fight a US coup. Hands Of Venezuela March in Washington, DC on March 16, 2019. By Ted Majdosz. We were invited to be in the audience of the most widely-watched television show in Venezuela. It is a remarkable political education-entertainment show hosted by the president of the National Constituent Assembly, Diosdado Cabello. The show, Con el Mazo Dando (loosely translated as “Hitting with a Club”), is a weekly five-hour show that combines politics with music and comedy. During the show, he covered 80 different news stories including a chronology of the electrical attack. Cabello uses biting satire. Guaido was the punch line of many jokes and his alliance with the hated Trump administration was highlighted. Gauido does not have the respect of the people of Venezuela. He is becoming of little use to the US coup and will possibly be discarded in the near future. While Guaido has overtly committed multiple crimes, the Maduro administration seems to have made a conscious decision to not arrest him as his actions are weakening him and exposing the coup’s connection to US and western imperialism. The State Department has been pressuring the media to call Guaido the “interim president” and not to call him “self-appointed” or “opposition leader” despite the fact that he has no presidential powers and no legitimacy under Venezuelan law. Any media that succumbs to this pressure is participating in a dangerous farce that is part of a US-led coup. This contrasts with the legitimacy of President Maduro. This week, international election observers wrote the European Union telling them they were “unanimous in concluding that the elections were conducted fairly, that the election conditions were not biased.” They described EU claims as “fabrications of the most disgraceful kind.” We described in detail the legitimacy of the elections and other essential facts activists need to know about this US coup. Singing and dancing as people arrive for “Con El Mazo Dando”. By Margaret Flowers. The people of Venezuela have shown their solidarity in standing together against the US and oligarch coup attempt. It is essential for those who believe in peace, justice and anti-imperialism to do the same. We agree with Vijay Prashad, solidarity is a process, not a slogan. We plan to build on the relationships we developed with the US Peace Council, World Peace Council and COSI among others. We will provide a list of items that COSI needs for their ongoing organizing in Venezuela, but so far they told us they need computers, printers and paper. They also need donations (a little goes a long way). They don’t have a website yet. If you can donate, contact us at [email protected] and we’ll find a way to get it to them. The first steps in building solidarity include demanding the end to all interference: ending US imperialism and preventing military intervention and war. It also means an end to the economic war, sanctions, blocking of finances and the embargo. On a near daily basis, it requires us to correct the record and confront the lies on which US imperialism is based. We will continue to post stories on Venezuela regularly and we urge you to re-post them to social media, email networks, and websites. We can defeat the regime change narrative by getting out the truth. Join the national webinar on Venezuela on March 26 at 7:00 pm Eastern. Register here. And join the national webinar on NATO and Latin America on March 28 at 8:00 pm Eastern. Register here. 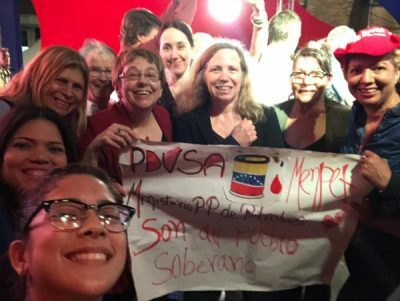 We will have more reports from our meetings in Venezuela posted on Popular Resistance. It is evident the US coup is weak. They have a weak leader in Guaido. They depend on lies because the truth undermines their every turn. They cannot participate in elections because they have very little democratic support. This contrasts with the strength of Maduro, who has the support of the people. The popular movement is positioned to stop the Venezuela coup and prevent a military attack. Our solidarity efforts in the US may prevent them from having to suffer more. All images in this article are from Popular Resistance unless otherwise stated.